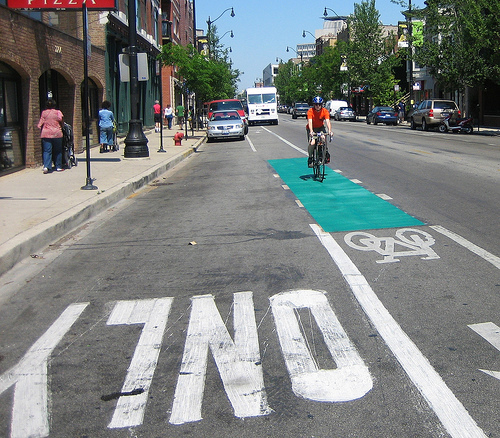 Is biking in Chicago a risky proposition? Bike infrastructure may be placed in areas that are most convenient instead of areas that are most dangerous to bikers, suspects Stephen Vance. 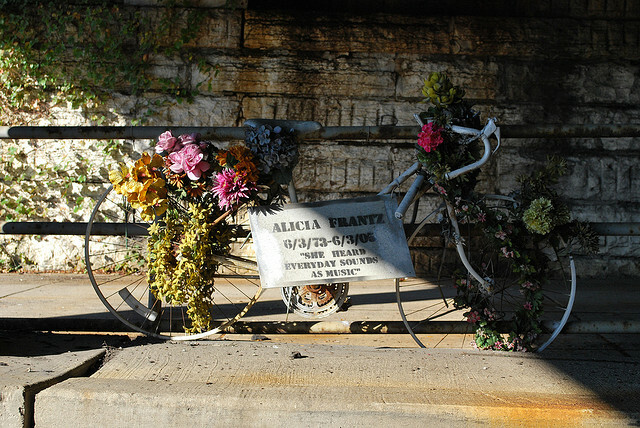 This is an example of a ghost bike, which memorializes bikers who have died on the road. Motti Pikelny would fall in the group of people who are maybe less averse to risk than others. He used to pilot glider planes in competitions. Yet, the Oak Park resident won’t commute to work by bicycle because he thinks it’s too risky. How dangerous is it to bicycle commute in the city? Pikelny would like to commute by bike for economical and environmental reasons. In fact, he has competed in century rides — 100-mile bike races — when he lived in Oregon. But the safety factor stops him from pedaling to work. He wanted us to approach the question from a statistical viewpoint. He wanted to know the dangers of biking in Chicago as compared to other modes of transportation (i.e., motorcycles) or recreational activities (i.e., skydiving). We talked to a lot of experts, all of whom said the same thing: This question is impossible to answer, but they all gave different reasons for why. Some say there’s not enough data. Others argue quantifying danger is subjective. Along the way, we learned how the decision to bike or not bike can be a heavy one — with or without key stats to help. There are data, but are they the right data? Many municipalities, including Chicago, as well as the state of Illinois, record bike injuries and deaths involving crashes with motor vehicles. In April 2010, the city of Chicago began tracking “dooring” incidents (fatal and non-fatal), as well. That’s when a driver or passenger opens a car door in the pathway of a biker and a crash occurs. Here’s some recent data from the Illinois Department of Transportation regarding bike injuries and deaths involving crashes with cars in Chicago. 2009: 1,402 bike injuries and six deaths. In 2011, there were 336 dooring crashes in Chicago. This kind of data is important but it doesn’t go far enough, said Jen Duthie, a researcher at the University of Texas Center for Transportation Research. Duthie is a bike commuter and gathers bike data. What’s unknown is the number of bikers on the road and how far they travel, said Steven Vance, author of Chicago Streetsblog, a bike advocate and local data wizard. Also, no data are collected on pedestrian-versus-bike crashes in Chicago or incidents where bikers collide with other cyclists. “I’m more scared of hitting a pedestrian on the phone than getting doored,” said Thea Lux, a Groupon employee who commutes daily during the summer months. Often, Lux said, people are talking on a cell phone and not paying attention as they walk into intersections. Researchers and policy makers can make generalizations about biking danger on a per capita basis by looking at the number of crashes that occur and Chicago’s population. But it’s not an accurate reflection of bike safety here. Vance said it’s impossible to say how likely a person is to crash on their bike. Plus, Duthie added, near misses are not recorded, even though avoided crashes shape opinions on whether biking in Chicago is safe. Harrowing, that is, because of all the near misses that scare bikers. Vance launched a blog in May called Close Calls, which allows Chicagoans to record their near-crash biking experiences. But Vance, ultimately, doesn’t care how dangerous it is to bike in Chicago. Unlike Pikelny, he’s already decided to commute by bike. That’s not a question, in his mind, at least. What’s more important to Vance is identifying specific intersections or stretches of roads that are the most dangerous — and fixing them. His other outlet, Chicago Streets Blog, pre-ordered a counter to track the number of cars and bikes passing through certain intersections. The city tracks that information in some cases, but he says his blog purchased the counter because the city wasn’t getting him the data when he asked for it. Vance wants to make the data available to the public, with the ultimate goal being to identify the most dangerous intersections and stretches of road in Chicago. He finds that bike infrastructure is often constructed in areas that are convenient, but not necessarily areas that bikers consider the most dangerous. But even with all the bike data in the world, determining danger — or in this case, risk — is still impossible. David Ropeik, instructor at Harvard and author of How Risky Is It Really: Why Our Fears Don’t Always Match Our Facts, says risk is subjective. “We delude ourselves about some risk that is higher than they actually feel by saying, well, my general feeling about this from my experience, from what I&apos;ve heard and read is that this won&apos;t happen to me,” he said. What that means is that biking in Chicago may seem dangerous to one person but may seem less to another. Catherine Bullard never thought that biking in Chicago could be fatal. That was before Bullard, a biker, received an urgent Facebook message late one night from her boyfriend’s roommate. It said please call when you can. “Without even thinking about it I knew that Bobby had been in a cycling accident, but I didn’t think for a second that he was dead,” said Bullard, who recounted her story to us while standing near the intersection of Larrabee Street and Clybourn Avenue — the same spot where her boyfriend, Bobby Cann, died biking home from Groupon where he worked. Cann, Bullard said, was an avid, safe cyclist. Cann was struck around 6:30 p.m. by a driver who was allegedly drunk at the wheel. Cann was wearing a helmet. Bullard hasn’t biked to work since Cann’s death. She’s conflicted about biking now. She never used to worry about getting hurt on a bike. Now she wonders: How is it that something that once seemed safe — especially for those who followed all the rules — now doesn’t? She wants to get back on the road. And she will. She’s determined. Except, for now, biking just seems too risky. Again, the hard comparative data that our questioner Motti Pikelny wanted isn’t available, so we reached out to riders to get qualitative perspectives. The goal was to get some perspective from bikers on the ground. What do they see? What do they experience? Riders we spoke with agree that Chicago is becoming more bike-friendly in the sense that biking is gaining a higher profile and the city’s adding new bike lanes. We found one particularly interesting set of riders at the Chicago headquarters of Groupon, the daily deals service. The office, located on the near North Side, has a robust biking community; among other things, it’s a regular participant in the annual Bike To Work week. According to the Active Transportation Alliance, the event last year had 7,000 participants citywide. As Groupon editor Sandy Kofler told us, just several years ago she was nervous about riding her bike on some downtown streets — enough that she would put her bike on the train, ride one stop, and then get off and resume her ride. The addition of bike lanes since then has helped a lot, she said. Today Kofler bikes to work, taking one of two routes to work from her home in Humboldt Park; the one she frequently rides has fewer bike lanes than the other, but at least she can avoid having to make two scary left turns. To get even more perspective, we recently solicited volunteers from Groupon to log their bike routes for three days. Consider these logs as anecdotes of what its like to pedal in the bike lane … or in some cases, the shoulder of the road. I reported my findings — the limited data, the wealth of anecdotes — back to Pikelny, who wasn&apos;t that surprised that there’s no answer to his question. It is, after all, what he suspected after he finished his own surface research. That being said, though, he hopes for better data collection in the future. That would be good, he said, for him as well as others who are contemplating whether to bike commute at all. And that would be helpful, too, for people like Bullard, who could at least lean on firm data to help decide whether to put her feet back on the pedals. Chelsi Moy is a Curious City intern. Follow her @chelsimoy. *Click on a person to view his/her bike log. Correction: A caption misspelled the name of a Chicago blogger and developer. The correct spelling is Steven Vance.